169. Max how many records can be retrieved by a SOQL query? 170. Max How many batch apex jobs can be concurrently in active or queued up status? Ans- There can only be 5 batch apex concurrently in active state/Queued as of today. 171.What is the Default timeout of callouts (HTTP requests) in a transaction? 172. When a sandbox is refreshed does the organisation ID of that sandbox remain same? Ans - No, the organisation id changes every time the sandbox is refreshed. 173.Given a salesforce record id how can you identify the object from the 18 digit id? 174. In analytical snapshots, can the target object have trigger? Ans - If the target object has trigger on it, the analytical snapshot will fail. 175. What are the different custom tabs that can be created in salesforce? 176. When writing a sharing rule, whome can you can you share the records? Ans - Records can be shared to Roles,Roles and Subordinates and Public groups. 177. Can you have assignment rules on custom objects? 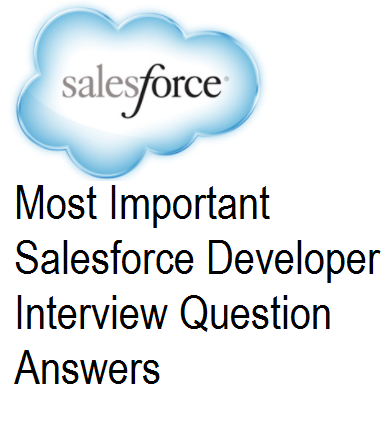 Jeez oh man,while I applaud for your writing , it’s just so damn straight to the point salesforce interview questions and answers 17 .